1. 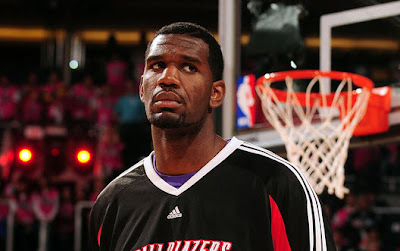 This article from Examiner.com touches on our friend Greg Oden and whether or not he has been worth it to this point. The kid was a force in his first and only season at Ohio State and showed a lot of promise which lead to him being drafted first overall in the 2007 NBA Draft. But since then, he’s been nothing but a disappointment averaging only nine points in his meager 39 (out of a possible 128) game career. 2. Just about everyone on the west coast reported yesterday that Blazers G/F, Martell Webster, could miss the entire regular season. Why are we so concerned about this? Blazers trainer Jay Jensen on Friday told the Oregonian that Webster will likely be out through the remainder of the regular season because of a slow-healing fifth metatarsal bone in his left foot that he fractured during the preseason. But Pritchard said Webster has not had the foot scanned since early February, so the team has no new information that would lead them to form that conclusion. I'm still not sure the Blazers will ever need Martell Webster now, with the addition of Rudy Fernandez and the surprisingly consistent play of rookie, Nicolas Batum. Your thoughts? 3. The team has struggled mightily against the higher scoring franchises in the league, and fortunately for us, someone did the research to prove it. You could explain a team having a lower winning percentage against the top 10 scoring teams as simply a reflection of playing higher quality opponents. That would be true as this group includes the Lakers, Boston, Orlando, and Cleveland. But the group also includes the likes of New York, Golden State, and Indiana. A lower winning percentage would be expected, but one that is 54 percentage points less than when facing teams ranked 11-20 is a bit staggering. Every time I see a run a gun type of team, I get extra nervous. In fact, I get more nervous when the Blazers play New York and Golden State than I do when they are playing one of those top 4 teams listed. You never know when one of the low level teams can get hot, put up 140, and embarrass this young Blazer squad. Martell will probably never reach the potential that was projected, and we really haven't missed him much this season. Batum will get better and better as he gains confidence. he is for sure the small forward of the future for this team. Completely agree with you David. I've basically forgotten about Martell and when I heard chatter about his return back in December, I wasn't excited at all. The last thing I want to see, are minutes taken away from Batum.